. : Lunar Palace v.5 - Manga: Sailor Venus :. 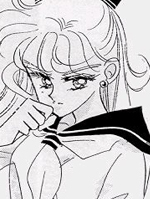 Sailor Venus acted as a decoy princess until Luna could train Bunny to be a Sailor Scout. It was set up this way in order to protect the princess and the crystal. Venus is the leader of Sailor Mercury, Sailor Mars, and Sailor Jupiter.